Have wanted to organize my photos for a long, long time and it was on my 2014 end-of-year-to-do list, but never got done because I was not feeling up to par. Now that I am feeling a lot better decided to tackle it before gardening season rolls around. 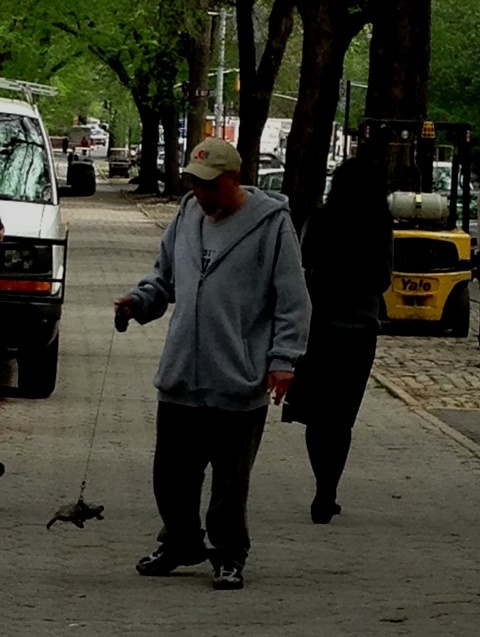 Yes, that’s a man walking his turtle on the sidewalk of 5th Avenue by Central Park, NYC. The turtle is a she and her name is Cindy. Wondering if the man is still walking his turtle? Would you believe it snowed again yesterday (March 1). Doesn’t mother nature realize we do not need any more snow? The temperature has been way below freezing for weeks (day and night) as a result the accumulated snow is not melting. Yesterday’s fresh snow added a few more inches on top of the more than 1½ feet of snow still covering the ground not to mention the more than 4 feet high snow bank by my driveway. First day of spring is only 18 days away, when will I see some grass? Will I have a spring garden????? This entry was posted in Husdon Valley, New York, New York City and tagged 3/1/15 snow, man walking turtle, NYC 5th Avenue, NYC Central Park, Poughkeepsie, poughkeepsie journal, turtle. Bookmark the permalink. wow…this is the very first time I saw and knew that you can walk a turtle!!! Always a first, isn’t it? They will have to find him first. How do like living in the NYC? Are you in Manhattan? I currently live in Brooklyn, but used to live in Manhattan and work there often. Years ago people living in Brooklyn moved to Manhattan, now they are moving back to Brooklyn. Shoveling the snow was easy as it remained fluffy, chipping away the ice was awful, my arms hurt for days. You must be busy getting your house ready for sale and planning your move, how exciting. Bet you can’t wait to get the keys to your new home. Wishing you all the very best. You are such an efficient and organized person I just know everything will go as planned. I cannot believe the winter you are experiencing. And we are in the worst drought in CA’s history – overjoyed by an inch of rain yesterday and our rain tanks are completely full for deep garden watering. Glad you got some rain, hope you get much more. I’ll send you some snow. 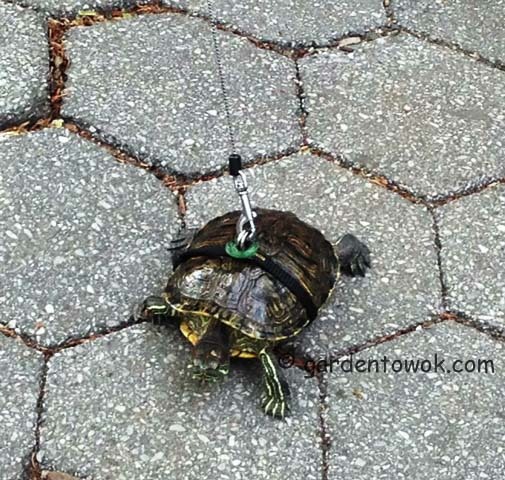 When I saw that first photo is looked like the turtle was hanging from the leash in mid-air! And like you, I’m anxiously awaiting spring – we are getting a storm tomorrow, but at least the temperatures are improving – it will be a high of 0C/32F – whoo hoo! (only after a winter this bad would that be a cause to celebrate!). Was supposed to get hit again today but the snow is staying south of us and in NYC and I am not complaining one bit. We made a record for cold and snow in February. We could use a few more inches of snow though If we just get a few more we will break the winter record for snow. Though after we get it I want a warm up and fast. I see you are just a bit short of your winter record for snow, may be you will get it today, supposed to be warm next week. First time I see a turtle walker! Thanks for sharing the photo. Wish the snow thaws for you guys soon. It was the strangest and most hilarious sight. This is a first for me for sure! Walking a turtle?!! Glad you are feeling so much better. Stay warm and well! Walking in NYC one sees many unusual (strange) sights, that’s why I love walking in NYC. Hahahaha! My daughter just moved from London to NYC and she just told me that she’s never been so cold! I don’t think she’s acclimated yet, since she’s mostly lived in Texas and Oklahoma! NYC got with another few inches of snow today, hope your daughter is staying warm and safe. I know what you mean, walking on the streets of NYC is great entertainment. Haha, I suppose turtles need some outside leisure time too, huh? I feel like we’re the only ones who didn’t get any snow though from what I’ve gathered, that seems to have been a blessing. Stay warm, Norma! Definitely, exercise and fresh air too. I will be more than happy to send you some of our snow. Too bad you did not encounter the man walking his turtle in Central Park when you visited NYC. Spring may be late this year but it will arrive, not too late I hope. Spring will arrive, may be a bit later this year for us, but it will be here soon. 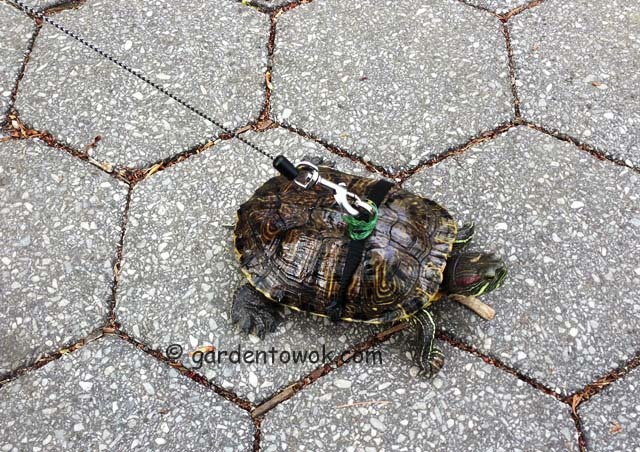 Very creative leash for the turtle, I guess they would be a very quiet pet if you lived in a apartment. Anyway, I feel badly about the weather you all are having, it’s barely rained here. We will have single digit temp tonight but starting tomorrow we will be in the 30’s and low 40’s during the day and 20’s at night, spring is around the corner. Thanks for the good laugh Norma! Sending some warm thoughts and breezes your way. Thanks. Glad you had a good laugh, what are the chances of seeing a scene like that in HK?. The weather certainly has been brutal. Environment Canada has already declared that it was the coldest February on record. Ever. Yesterday I walked up to a coffee shop with a friend (20 minutes) and the tips of my fingers froze. As did my thighs even though I was wearing a long down coat. I’m sick of this weather. What a strange thing to see in NYC. I hope he cleans that turtles underside when he brings her home, it must be disgustingly filthy. I too have had enough of this cold snowy winter. From what we gathered the turtle is very pampered. I’m liking this because of the turtle…not the snow! How cool to see someone walking a turtle! I have artist friends who rescued a turtle in Florida whose shell had been damaged and they have him as a pet. His name is Bob and he has his own Facebook page…he’s become “known” in the arts festival circuit. I don’t know if Bob would tolerate a leash, but I’m sharing your post! 🙂 I do hope you’ve seen the last of the snow and that some warm Spring weather is on its way. Glad you liked the post. How cool that your friend’s turtle has his own facebook page. Thanks for sharing my post feel free to reblog. OMG!! this is so funny… walking a turtle.!!. this is cool. I have never seen someone walking a turtle before.. but she looks poor in this belt :(… Last year we had snow in May!!! can you believe that!!! It was a hilarious sight. We had snow mid-April last year, hope that is not so this year, we have more than enough snow for a long long while. I think walking your turtle is a bit much. The job would take all day to get to the corner! Bet you are anxiously waiting for the arrival of you sister, how exciting, will she be staying the whole summer? Oh no, but it will be winter in your part of the world. This week’s warm days and cool night, maple syrup should have a good run this year. Besides maple sysrup she’ll probably bring you some maple sugar and maple candy as well. How cool is that, I would say! 🙂 hahahahahahha! The turtle & the owner needs some excercise! Thanks for visiting and taking the time to tell me about the turtles walker, I wonder if it is the same person or another turtle walker?